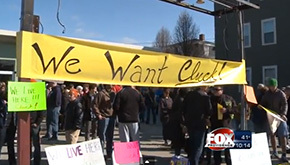 Federal Hill and West Side friends and neighbors rallied on Sunday morning in support of Cluck!, an urban farm supply store that is trying to open at the site of a former gas station on Broadway. The business was approved by Zoning to open but was challenged in court on a technicality and lost, forcing owner Drake Patten to begin the Zoning process from scratch. Read Drake’s commentary on what has happened. Wow… The guy from the church sounds ridiculous. The owners of the Cluck site need to put up signs that say “unauthorized vehicles will be towed” and sit there and watch on Sundays. When someone parks, they have the car towed. Teach the church a hard lesson. My understanding is the store’s owner has offered to adjust her opening time on Sundays so that parishioners would get first dibs on street parking. Cluck also has the required number of off-street spaces required by zoning, furthermore, the store is located on a bike lane and heavily traveled bus route, many of the customers will be walking, the store offers delivery so people do not need to bring cars, and finally, it is not the type of business (like oh say, Seven Stars a block away) that attracts a lot of people all at once at one time in the morning which would conflict with the church’s parking needs needs. Also, Cluck plans to close one of their curb cuts which will allow the City to create one new on street parking space. Wow. I don’t even know what to say to that. That’s just horrible. The people that belong to that church should feel embarrassed to be represented that way. I agree with Jim about the towing idea. I don’t know if there’s any other way to teach them the flaw in their logic. God did not give them that lot. Being a biker, a non-car owner, and a small-time chicken-raiser, I am in no way supportive of the church’s parking position, and have made that clear with my various posts on the subject. That said, I went to talk to the spokesperson for the church, Jason Simonian, on the day of the picnic at Cluck, and found him to be reasonable and genuinely concerned about how older parishioners would get to worship. I think that the appeals are ridiculous, and that if anything there should be less parking on Broadway, not more, but I would like to see the city address the problems faced by older folks in a spirit of imagination, without demonizing the church. I think that proper RIPTA service and better bike infrastructure, along with carpooling for elderly and so on, could really make it possible to do with fewer spots. If the church was truly concerned about parking, they could have bought the gas station years ago. Don’t misunderstand me, I’m not saying that they should be able to block this over parking, or that they shouldn’t have bought the spots if they really cared. What I’m saying is, let’s see this as an opportunity. Anti-car organizers (especially bike-organizers) are often seen as a hoard of young privileged yuppies, which is not fair or true. We can use this as a moment to address the concerns of older people directly, and to show that having a less car-oriented neighborhood is good for everyone. In the worst of all worlds, the church is lying. In the best of all worlds, they’re telling the truth, and if they are telling the truth, however ridiculous their position, there’s a way to address it that still keeps the core of what we want–Cluck opening, and fewer cars. That church spokesman is lying through his teeth. First of all the lot that Cluck! occupies is NOT Public Property. Maybe someone needs to school him on that fact. And the church can no longer say they weren’t notified. The arguments sound reasonable except that the overall issue of getting seniors to church should have zero bearing on the opening and usage of private property. The church parking issue only relates to the opening of Cluck in two ways. The property owner was within their right to end parking on their property at anytime. It is their property to do with as they see fit within the law. The church realized this and apparently offered to buy the property multiple times and had their offer rejected. So by opposing the church is essentially punishing them for simply trying to rent the property and earn a living off their own land. On street parking is a common resource that the church does not have an exclusive right to over the needs of any citizen. Even assuming that they do have some additional need they have rejected as inadequate the voluntary offer of a shift in opening times. A tax free organization has worked to cost a local landlord the ability to earn money off their property, a private citizen many thousands of dollars in zoning and legal fees, and the city an increase in the value of the property tax base. All the while demanding that others solve their own parking issue for them as part of this process. This feels unreasonable to me. It feels unreasonable to me too, and incredibly so. I basically feel as though we’ve won–it may be some time before that is borne out officially, but it’s going to happen–so what I’m saying is not that we should support the manifestly ridiculous position of the church in respect to Cluck or parking, but that we should take their position as an open invitation to message about why a more walkable, bikeable, transit-oriented city is good for seniors. Instead of grousing about them, because it feels good to do so. When the existing congregation is elderly folks who moved away but still drive in for church, some church leaders reach out to their neighborhood for new parishioners. Good luck with that now, father Simonian. It is not won yet. All parties who have opposed it have promised to take the city and Cluck to court at the end of the second zoning process and another $10 – 15k investment for Cluck. If the church’s spokesperson was truly worried, he would be worried about parking on THE OTHER side of the street. I heard . seen him say numerous times about seniors having to cross the street. Also, as I remembered, there are at least two house lots, maybe 3, that serve as parking on Armenia Street, behind the church. it looks like it holds at least 20 cars, maybe more (its hard for me to do the math on google earth.) as well as on street parking on that street, on Marshall, on Courtland (on both sides of broadway) as well as in front of the church (although there is a bus stop right in front of the church) So even more I think the parking is a total red herring. I’ve heard there are a couple big names behind this, one of which might attend that church… and also pushed VERY hard for Cranston to not pass the chicken ordinance. BUT I still think that this is all about that old gas station location. It is most perfectly located for something bigger and someone wants it, and wants Drake not to have it. The Providence Journal: Full steam ahead for CLUCK!